VetIQ Healthy Bites Urinary Care for Cats and Kittens have been formulated to enhance the needs special of indoor cats. 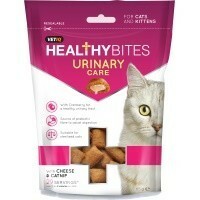 Healthy Bites contains cranberry for a healthy urinary tract and antioxidants to support a healthy immune system. It also includes plant extracts to help reduce cat waste odours and is rich in Omega 3 fatty acids for a healthy skin and coat. These tasty bites are filled with a delicious cheese and catnip flavour that your cat will love! I like all M&C products. This one is no exception - it's very palatable for my cats. It's not quite as practically useful as the brand's other products (such as Hairball, or the Breath & Dental treats) in that it is more of an all-rounder treat. A big plus point is that the bag is very sturdily resealable. Recommended!